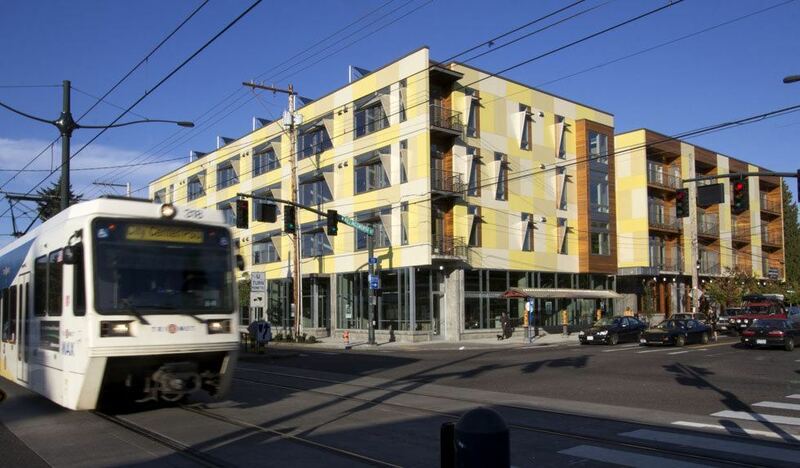 Killingsworth Station in North Portland landed LEED Platinum certification this week, a designation that developers say makes it one of the country’s greenest condominium projects priced under $300,000 per home. The project, a partnership between the Portland Development Commission and Winkler Development, was developed to be affordable housing. The 57-unit building is located along the Max Yellow line at the intersection of North Interstate Avenue and Killingsworth. The building offers down payment assistance loans for eligible first-time home buyers, along with some property tax exemptions for purchasers with incomes at or below $77,000. Prices for one-bedroom homes start in the $160,000-range. With condos on the market since July, developers say 32 percent of the building is under contract so far. LEED-worthy features include solar-thermal hot water, a green roof, stormwater management features and sustainable bamboo hardwood floors. The building was designed by Vallaster and Corl Associates. R&H Construction was the general contractor.